OR if you are an Affiliate Owner, have your grips custom made to suit your Box Colours!!! An upgrade to the traditional Pullup Grip! JAW Three was developed due to consumer demand asking for hand protection across THREE fingers. 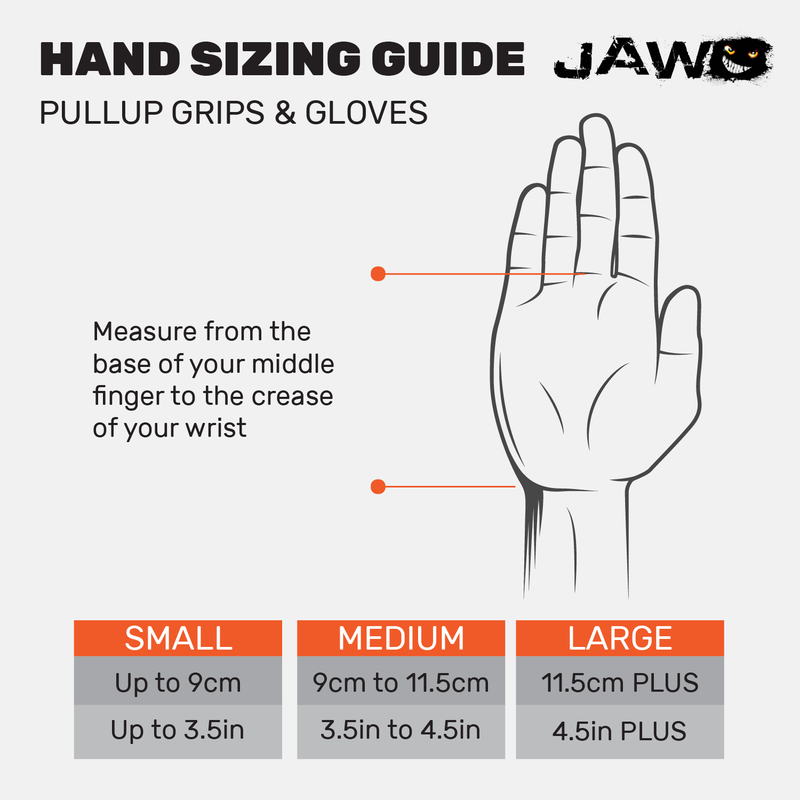 JAW Threes have three finger holes and a wide palm coverage designed to eliminate friction with their incredibly soft, durable, hand-stitched fabric. So whatever your vice, JAW Three's are super absorbent and will remove perspiration away from the hand to maintain grip during the most taxing of workouts. A descendant of the JAW Pullup Grip, the Threes fit and sizing specs are identical. As per all of our products, the Three's are handmade in Australia so you can be reassured that the quality is second to none. When sized and worn properly, JAW Three's should be very snug like a sock, but they should not cause discomfort. If it is a struggle to fully open your hand while wearing your grips, they are too small. If there is an abundance of extra fabric that bunches up in your palm, they are too big. Don't be shy with chalk. The more you use the less palm friction you will encounter. JAW Pullup Grips + Chalk = Happy Hands. Hand wash only. Keep in mind, though, the dirtier JAW Pullup Grips are the better they work! Ensure to maintain (file or shave) your calluses to further minimize the risk of tearing. Hand Protection for Active Hands! Be JAWSome & Subscribe for deals!